Refer a neighbor, family member or an acquaintance to our dog & cat pet service and receive $20 or $40! We have what I believe to be the most aggressive compensation program in the U.S. for rewarding people for their pet referrals. Still receive a $20 check absolutely as fast as we can put it in the mail once your referral pays us upfront for that month’s service. You are NOT required at all to be a current client of ours. We are the only one I believe doing this as pet pooper scoopers in the U.S. Receive a $40 check by our company in a timely manner once you have referred another customer wanting regular ongoing service. Your referral should definetly have reasonable intentions to continue ongoing pooper scooper service for at least 3 months, if not longer. You can NOT refer someone that is living in the same house as you do. You must refer us to someone that lives outside your own home. You may either refer a client that is interested in once a week dog or cat pooper scooper service or every other week poop scooping. Although we do not reward referral compensation for once a month scooping, we *may* for very large one time only dog poop cleanings. We absolutely live to hand out free money! There is no limit to just how much money you can accumulate. By all means-go hog wild. Although we would truly love to be your personal pooper scooper before you refer someone else to us, it simply is not necessary. Taking this a step further, you need not have ever even met or seen our dog pooper scooper team to take advantage of our referral compensation program. For this very reason, we highly suggest you spend a few minutes at least getting to know a little about us via this website so as to be able to answer the few questions your referral person may have. Better yet, tell them to point their browser over to this website at PoopButler.com so that they can themselves get familiarized with our rates and services for dogs and cats. Naturally, you can just suggest they give us a call and we’ll take it from there. Don’t forget to tell them that you sent them over to us and you may remind them that our pet waste pooper scooper service covers all of Orange county, California. Again, please remember that although we accept ALL referrals, the ones in which we compensate $20/$40 to you are for routine weekly or every other week service. 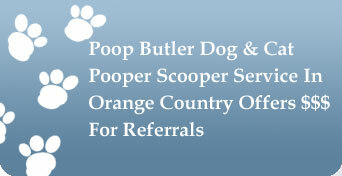 As far as where we offer our pooper scooper services for dogs and cats, we’ll take our scoops anywhere a dog poops. Or a cat litter box hides. 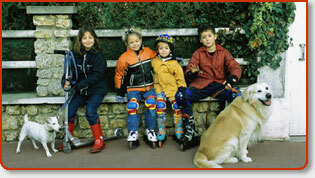 Residential homes with one or several dogs, pet friendly apartments, large dog kennels, you name it. Irrespective of whether it is a residential client or commercial account we are enthusiastic about “taking their dogs business” all the same. Lastly, we are a bit flexible and aggressive on referral compensation for large accounts or ones that lead nearly immediately to securing other clients. Don’t forget, we clean cat litter boxes along side our current dog pooper scooper clients. As the owner, how do I personally feel about receiving referrals? “I absolutely love referrals and don’t know where I would be without them.” Allow me to thank you ahead of time for your faith in me as a person and your choice in a professional pooper scooper company. May Jesus Christ Bless You Richly! I also believe that referrals are a testament of my love and appreciation for my customers and their dogs and cats, as well as the respect I have for the animal waste removal industry as a whole. I understand that you may feel your word and reputation is “on the line” each time you have made a referral in the past to someone. That's no small thing. I take your referrals very serious. Hey it could be your boss and he's a little hesitant about using our pet service. No worries, we’ll take care of everything so he/she doesn’t have to. He’ll be wondering how he ever stepped foot in his backyard without a dog poop pickup service for his dogs. You’ll look like a genius and probably be up for a promotion (hey, stranger things have been known to happen). And I will have had the pleasure of servicing someone new. A full circle win-win scenario.